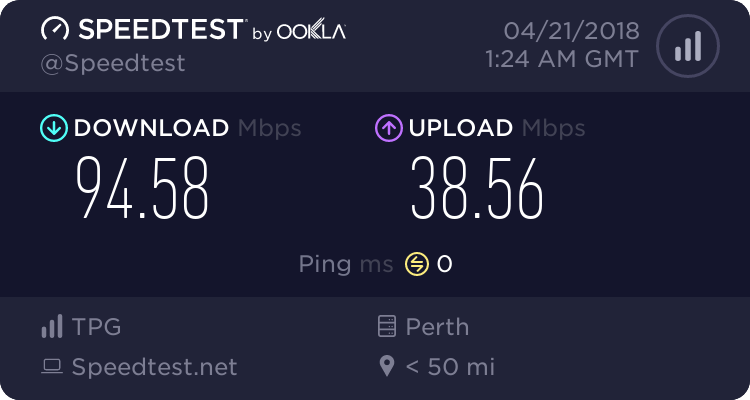 I am seeing the speeds on my nbn100 plan drop often and a lot of packet loss when the kids are gaming or streaming a lot. I have set the router up following the set up guide, still happening. Any solutions I should be trying? We can see that you have been in touch with our Technical Team and the issue has been escalated to our Engineering Team. As per initial assessment, we are unable to identify any fault on the line or network at the moment. However, we can still see that the connection is dropping out. That being said, we'd like to further check what is causing this and will have one of our Senior Technical Specialists contact you for assistance. If you have a preferred contact number and available time to receive a call, please send it via private message. Hi @treffo, the Senior Technical Specialist tried to contact you, but to no avail. Please PM us your best contact number and available time to receive a call so we can process a callback. Hi @treffo, thank you for sending us a private message. We can see that you have been in touch with our Technical Team and was advised to use the TPG supplied modem for comparative testing. The connection looks stable at the moment, but we'd like to check what is causing the speed issue. Have you tried checking the speed here: http://www.speedtest.net/? Hello and thank you for the fast response. 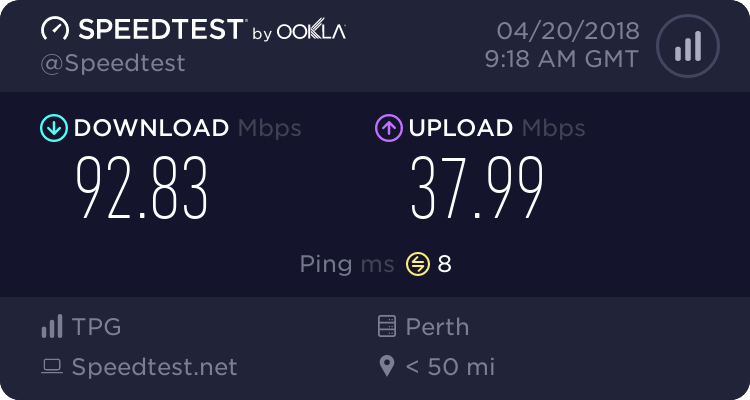 I have just run another set of speed tests, bear in mind the router (TPG supplied VR1600v) was rebooted 45 minutes ago. before the router was rebooted this morning (by my daughter as she was trying to back up some work and the upload was 12Mbps, and when I checked the stats on the router it showed 18Mbps up for current and 20Mbps for max rate. We are glad to know that the speed has improved, but we'll see how it goes, @treffo. For now, please leave the TPG modem connected. We'll continue monitoring the connection and please let us know if the issue persists so we can investigate further. Thanks for lettting us know, @treffo. What's the speed you are getting at the moment? Is it happening whenever you connect multiple devices or even with only 1 device connected? Thanks for the info, @treffo. Are you free to receive a call now for troubleshooting?